Aqua Nature Apartments for Rent in Torrevieja Area. Find and book your accommodation in La Mata easily online at Espana Casas. Affordable and spacious accommodations with privacy and comfort. Local service is available. 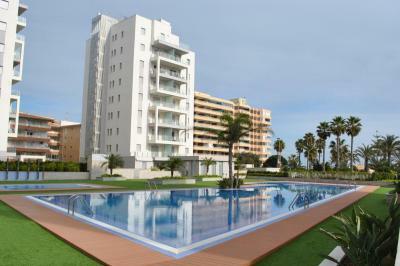 This beautiful residential complex Aqua Nature in La Mata is situated just 50 meters from the beach. It is a tourist resort located between Guardamar and Torrevieja. The immediate area has many beautiful long sandy beaches and a wide range of services provides you for your daily needs. The center of La Mata and the proximity of cozy terraces and a large choice of catering facilities is an absolute plus. Aqua Nature residence is only 5 minutes drive from the beautiful and bustling town of Torrevieja. A bus takes you every 15 minutes to the center of Torrevieja. In this complex you will find several 2 bed apartments for rent with Sea Views finished with quality materials, equipped with air conditioning in all rooms, SAT TV, and Wireless Internet. Each apartment has a furnished terrace. There are 2 elevators in each building, so you can even enter the underground car parking easily. The pool is spacious, has a children's section. There is a playground for toddlers, a basketball, volleyball, tennis court and some jeu de boule facilities. This complex guarantees comfortable holidays with sea views on one sight and lake views on the other sight. In case you would like to receive more information about our Aqua Nature La Mata Listings or more substantive information about our rent and management service, feel free to contact us. We would be delighted to be at your service!